In My Creative Opinion: Back at Christmas cards again! A fun day on Saturday when Ardyth, Emily and Natasha made their way up to Muskoka to spend the day with me. Always a good time with these girls. Ardyth brought her Hero Arts Holly Jolly stamp set with her at my request after I saw a card she did using it a while ago. 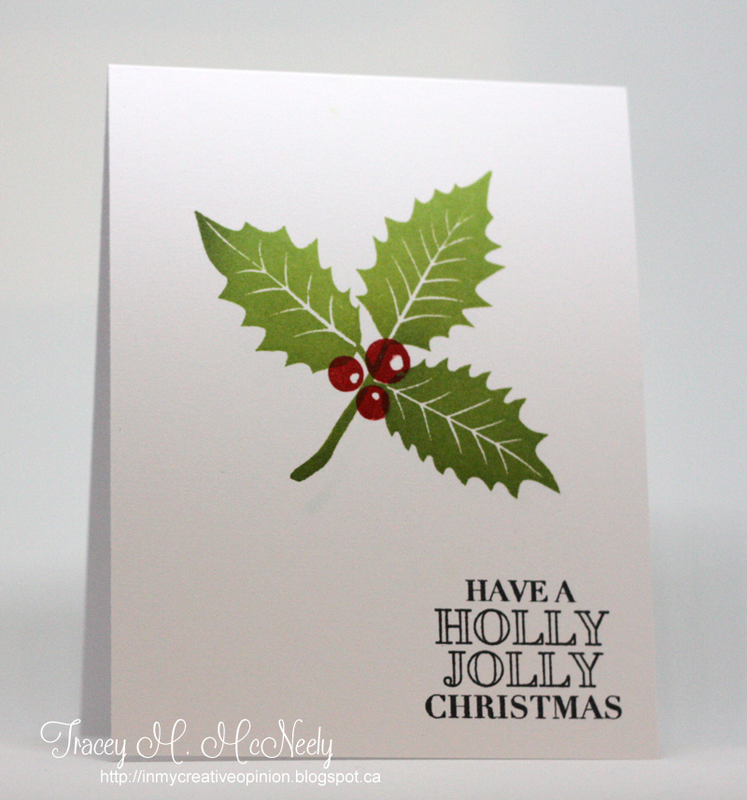 So I stamped the holly on both white and kraft cardstock using the Hero Arts Ombre Mint green ink pad. I finally used my MISTI (with Ardyth's urging) that I have had for over three month's now. I bought it before selling/buying and moving houses so today I learned how WOW it really is. Since the end of October is now closer than the beginning it is time to get back into making Christmas cards for this year. These look fantastic! So glad we were able to work on these together! Oh so CAS-delish! Think Ardyth could bring it to my house? Nice card; hope your "day" was all it should've been with your crafty friends! Beautifully crisp and so clean and simple. Lovely. What a great CAS Christmas cards Tracey. Glad you had a fun day with your crafty friends and good luck with the MISTI! 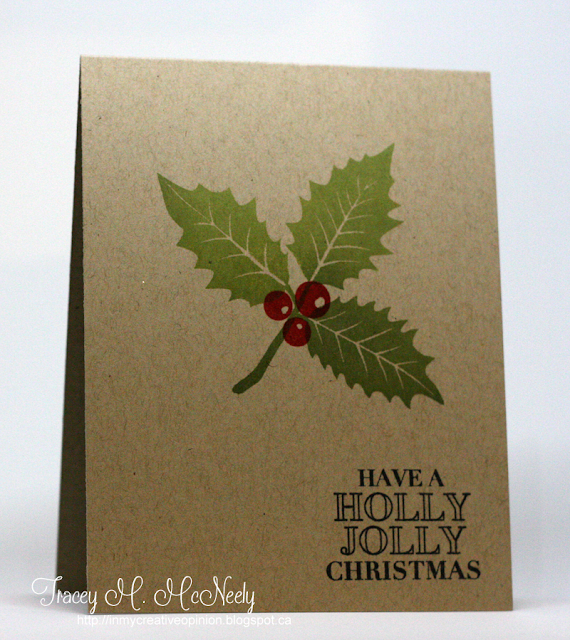 Two gorgeous one layer cards, Tracey! I love how you created the ombre effect with your inks...it adds so much interest to your CAS design! So glad Ardyth encouraged you to use your MISTI, and that you had so much fun stamping and playing with 'the girls'! So pretty!! Love the cas design, looks awesome on kraft! So glad you had a wonderful crafting visit! Beautiful, CAS Christmas cards! I love that ombre ink! Sometimes it just takes a little nudge to take the leap; I love the MISTI! Those cards look fabulous! You guys must have had a great time! Two absolutely beauties Tracey. Love how crisp and clean the stamping is! A pair of CAS lovelies!! Glad you had a great weekend , think I saw the beautiful picture on FB. Love the card! So pretty Tracey! Okay that's it. I really NEED a MISTI and some ombre ink pads!!!!! Oh great — another accolade for the MISTI. ;) Someday I'll cave, I know I will! The subtle shading of the ombré ink is ideal for this style of CAS card! The clean design allows it to shine. These are so beautiful...love your pretty holly and I love the way it looks on both background colors. Wow, I can't believe you've had the MISTI for that long and never tried it out! It's an amazing invention isn't it? CAS perfection. Love the beautiful and bold images. Flat for mailing and stunning with your home made touch. So, I took forever to buy the MISTI and you bought it and took forever to use it. Can't decide which of is is more rediculous!